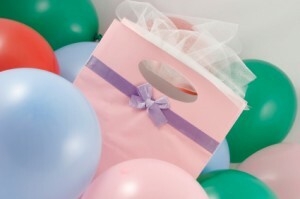 Typically, it is the maid or matron of honor’s responsibility to throw the wedding shower. However, sometimes it is hosted by another member of the wedding party. If you are the maid/matron of honor and no one else is already planning on throwing a shower, you probably need to step up! If you are having a bridal shower for females only, it is typical to invite the bridesmaids, the bride’s close girlfriends, and any female relatives that are close to the bride and/or groom. If you are having a couple’s shower, you should invite the entire wedding party, close friends and family. (Even those who probably will not be able to attend should get an invitation.) Most of the time, children are not invited to the shower but can be. If it is a concern, address it on the invitation by letting guests know whether or not children are welcome. If it is a surprise shower, be sure to say so on the invitations. You wouldn’t want a guest to spoil the surprise! Invitations should be sent out at least 4 weeks before the shower, and the RSVP date should be between 1-2 weeks before the shower. If you have been invited to a wedding shower, make sure that you RSVP by the date on the invitations whether or not you are going but ESPECIALLY if you are going. The host/hostess will only plan for enough favors, food, etc. for those who say they will attend. If this is a surprise shower, remember to keep it a secret, even if you aren’t going! When it comes to planning the wedding shower, the bride and groom are pretty much responsibility-free. The only thing they need to help with is the guestlist. Make sure your host/hostess knows who you want invited (and maybe more importantly who you DON’T want invited)! You will also need to provide the contact information for those you want to invite. If we left something out or if you have more questions about wedding shower etiquette for invitations and guestlist, ASK OUR ULTIMATE BRIDE!